The long running Simpsons has been seen to be ‘prophetic’ in its predicting of key events in the same way the 1960s Paramount TV series Star Trek made predictions within a science fiction narrative that have gone on to become science fact. Arguably, The Simpsons predicted Pokemon Go. Bart was seen in one episode in a tree house with his phone with Pokemons running around the garden and long before the 2015 episode, ‘Trumptastic Voyage’ predicted that Donald Trump would become President of the US – not yet evidenced in his appointment but certainly with a significant opportunity as of writing July 2016. In 1997, the Ebola virus infected Springfield with Marge reading a book on its symptoms, mirroring the largest ever recent Ebola outbreak between 2013 and 2015 (the disease was first identified in 1976). The Simpsons has become iconic over the years with a range of appeals for younger but also older, more politically and culturally aware target audiences. Not everyone likes The Simpsons, however. George Bush Senior, while President of the US in 1992, stated that he wished more American families were more like The Waltons than The Simpsons (The Waltons were a squeaky clean deep south Christian American family living through The Great Depression and World War II). 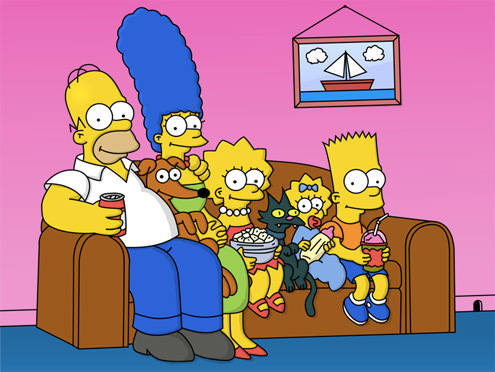 Critics of Bush’s comments, including co-creator Matt Groening, pointed out that although the Simpsons family often seem dysfunctional, which is the nature of much of the comedy, at least they are still together as a family, unlike most American families.